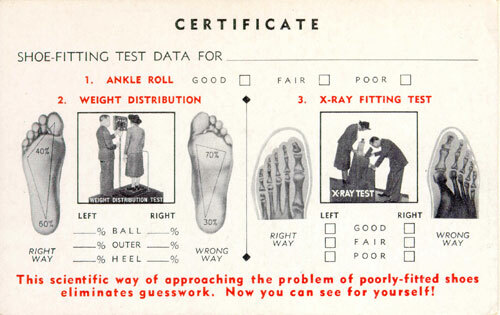 Amy’s dad told us about this the other day and we didn’t believe it, but it’s true: in the 1930s and 1940s shoe stores used to have an x-ray shoe-fitting fluoroscope to see how new shoes fit! Customers would stick their foot in a hole in the bottom of a wooden cabinet and when you looked through a viewing port you could see a fluorescent image of the bones of the feet and the outline of the shoes. It wasn’t until 1949 that the danger of the fluoroscope was revealed and the machines were quietly phased out during the 1950s. This is the craziest thing I’ve ever seen! These devices usually had three viewing ports (see the picture above): one for the child, one for the parent and one for the shoe salesman. The child would wiggle his toes to show how much room there was inside the shoe. The bones of the feet were clearly visible. 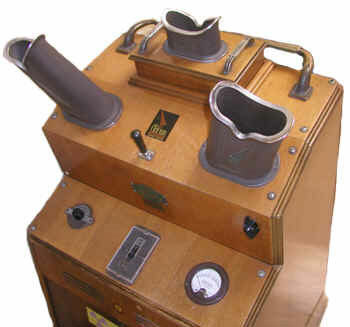 The sales pitch for the fluoroscope allowed salesmen to better fit shoes, and made it more fun for kids to go to the shoe store. During the Great Depression the most popular sales pitch was that the fluoroscope allowed the best possible fit, which made for longer lasting shoes, and implied that customers would not have to buy as many pairs for themselves or for their children. 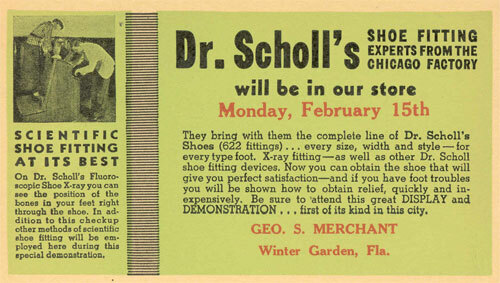 Who knows, this new recession might bring this cool device back in style at your local shoe store. This entry was posted on Saturday, December 27th, 2008 at 3:13 am CET and is filed under Craziest Things I've Ever Seen	with tags . You can follow any responses to this entry through the RSS 2.0 feed. You can leave a response, or trackback from your own site. Om my!!! Cool!!! I wish they could bring back, in a safe way.